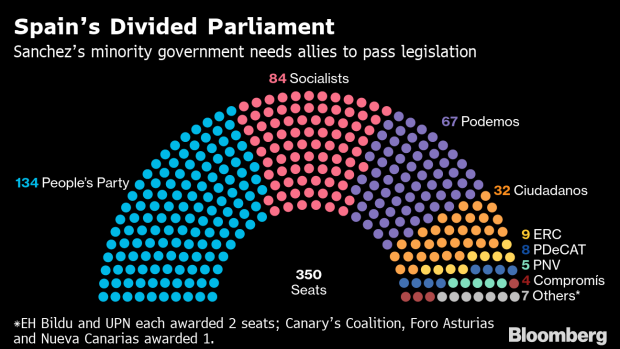 (Bloomberg) -- Spain’s parliament blocked the ruling Socialist party’s 2019 budget, significantly increasing the chances that Prime Minister Pedro Sanchez will call an early general election. The 473 billion-euro ($535 billion) spending plan was rejected, by 191 votes in the 350-seat chamber, after the government failed to secure backing from the Catalan independence parties it previously relied on for support. Sanchez’s effort to get the budget approved was doomed to failure. Talks with the Catalan parties broke down last week ahead of the trial of 12 pro-independence leaders accused of crimes linked to a 2017 attempt to force a secession. The lawmakers from Catalonia were reluctant to support the minority government in the middle of a trial that independence advocates have labeled as political persecution. Sanchez’s Socialist allies prefer April 28 as the potential date for a general election, El Mundo reported on Wednesday, citing people in the party it didn’t identify. The final decision will rest with Sanchez, the paper said. Cadena Ser radio reported Wednesday that he will decide in the next few hours. The Socialists are in a technical tie with the conservative People’s Party, according to a poll by Celeste-Tel published Wednesday in El Diario.es. Sanchez’s party has 23.7 percent support, while the PP has 23.1 percent, the telephone poll of 1,110 people showed.